The ALEX Toys - Artist Studio, Super Art Table, White, 711WB introduce children to the creative world of art. This solid wood table with artist print and white background is easy for adults to assemble and includes (2) matching benches. The chalkboard tabletop surface features a paper cutter, recessed cup holes, cups and a printed canvas storage bag. Let the artistic fun begin! Using the Super Art Table, your child can learn how to draw, paint and express their creativity. They will learn all of the valuable skills to become more talented at arts and crafts as a whole. By using the included paper roll to draw whatever comes to their mind, they'll also form new hobbies and develop skills that they can bring to future projects. ALEX has earned the reputation over the last 25 years for supplying quality art supplies and activity kits. ALEX believes that children deserve the opportunity to express their inner artist in the most open-ended way and our extended art line provides them with the materials to create masterpieces in vibrant colors and mixed textures from oil and chalk pastels, to metallic and water color pencils, to glitter paint. It all begins with a brushstroke... it all begins with ALEX! 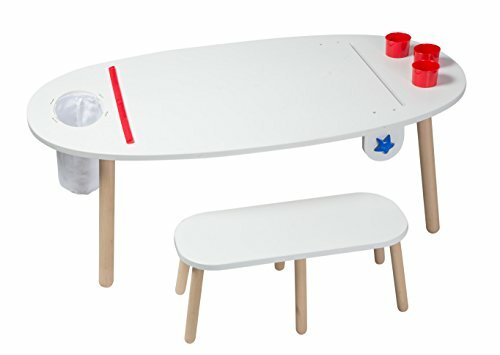 The ALEX Toys - Artist Studio, Super Art Table, White, 711WB is recommended for children age 3 and up. ALEX Toys takes the mission of providing children with quality creative products that foster personal expression and build self-esteem to heart! ALEX products are currently sold in over 80 countries worldwide in specialty toy and retail shops. Visit www.amazon.com/alex-brands for more information on Alex Brands and our best-selling line of educational and entertaining products for kids.